Kenyans are using social media more and more to vent their frustration against acts of parliamentary cronyism and personal pocket lining. Back in 2003, under the new Mwai Kibaki government, Kenya's MPs quadrupled their pay as their first order of business after the 2002 election; since then they have tried to increase their income far above the rate of inflation on three further occasions; however, a more concerned Kibaki has been doing a grand job blocking the most egregious demands. Has the free press, and a more networked populace (mobiles and social media), helped make Kibaki and some of other MPs more sensitive to the concerns of the people? Full credit must go to Kenya's current administration for being open to innovative ideas around the development of online transparency, government accountability. and allowing social media activity to flourish. As Shadow Election team members, witnessed recently at the Open Knowledge Festival in Helsinki, Kenyans were the most active African representatives, and Kenya was one of the most positively talked about countries in regards to adopting open data and online technology to solve economic and civic challenges: the most renowned of such projects being M-Pesa (mobile payments) and Ushahidi (crisis mapping). 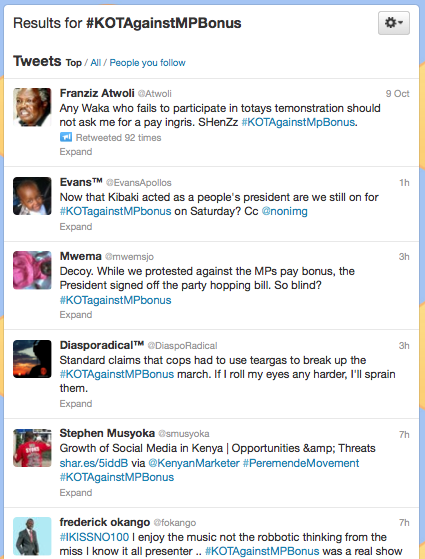 Therefore, it is not surprising that the offensive golden parachute (bonus) that MPS recently voted for themselves generated something of a social media storm leading up to protests just hours before the President Mwai Kibaki declined to give assent to the amended Finance Bill (2012) that was passed by Parliament on Thursday October 4, 2012. You can see the growing audacity of Kenya's to express their concerns in the comment sections of news articles and blog posts – even on highly visible mainstream channels as the Daily Nation. 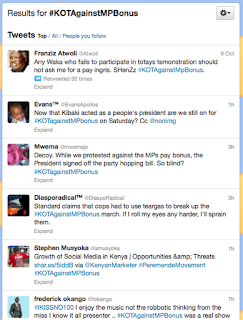 The troubled waters can still be felt in the active messaging around the Twitter hashtag #KOTAgainstMPBonus – which was also one of the channels used for organizing the protests. So what has this got to do with Shadow Election? We are currently trialling an early Beta version of our new Shadow Election interface in the USA; however, we will be releasing Shadow Election Kenya in the near future, and it will later combine features and lessons learnt from both the US and earlier Finnish versions. We have also been talking with local civic, development and potential media partners, so that we can launch Shadow Election Kenya more vigorously. Based on these discussions, we are expecting a strong interest in our service, and therefore we have to think very carefully about what we are expecting from our users and what levels of accuracy we can claim. Are there dangers of speaking out about politics in social media? It is crucial that the Kenyan body politic accepts the new terms of the game (for better or worse) as terrible damage would be done if they lost faith and started trying to get the social media genie back into the bottle. Social media was used by the Bahrainian government to crowdsource the process of identifying and tracking down Pearl Roundabout protestors. However, without the overwhelming assistance of Saudi Arabia, and acquiescence on the side of America due to their strategic interests, the outcome could have be quite different from the current sorry state. The context of Kenya is very interesting for Shadow Election, as the press has always walked a freedom tight rope; whether real or not, some fear of retribution lingers on in the air after more oppressive times (eg – the attacks on the Standard newspaper and KTN television in 2006). And to this extent there might be a mixed reaction to Shadow Election. They say if you don't give people a voice, they will make themselves heard! Surely an open and constructive democratic debate in social media is better than forcing people to make themselves heard on the street – where there is an ever present threat of violence, both to the state and the people.